An upright growth habit with a shape resembling a candelabra. Candelabra Aloe plant, Aloe arborescens, is a very elegant. The same uses as Aloe Vera. Also known as Tree Aloe, Candelabra Aloe plant is native to South Africa and prefers well drained soils in a partly shaded position. Drought resistant and tolerant of a light to medium frost. Evergreen plant, growing to 2m. 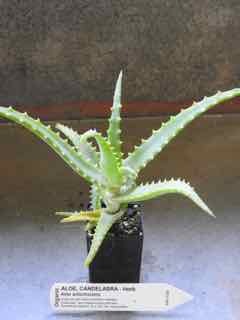 Be the first to review “Aloe, Candelabra plant” Click here to cancel reply.